US officials have denied editing Texas police dashcam footage showing the arrest of an African-American woman who died three days later in custody. 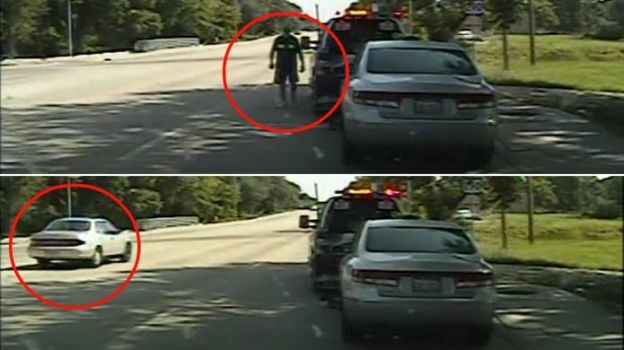 Footage of the 10 July arrest shows Sandra Bland’s car being pulled over for failing to signal and then an ensuing confrontation with the officer. There are several jumps during the 52-minute film, which has had more than one million views on YouTube. But Texas authorities say it was not edited and that it will be re-uploaded. The coroner said the 28-year-old hanged herself in her cell but her family has demanded an independent post-mortem examination. State officials and the FBI are both investigating her death. In the video, released by the Texas Department of Public Safety (DPS), Brian Encinia, a white police officer, is seen issuing a ticket and then asking her to stub out her cigarette, which she refuses. She gets out of the car and they move out of vision, but the audio suggests the confrontation becomes physical before more officers arrive. Several breaks in the video were highlighted on social media shortly after the film was released with many using the broken footage to question the entire film’s authenticity. In a statement released on Wednesday, DPS spokesman Tom Vinger said the video “has not been edited”. “Some of the video… was affected in the upload and is being addressed. We are working to repost the dashcam video,” he added.